In an opening shot, a white-haired man holding a shotgun stands before an oversized American flag with the gun pointed at the viewer. What happens next is both thought-provoking and amusing, and provides a glimpse of the absurdity that can simmer in the American melting pot, especially when preconceptions lead to serious misinterpretations. This scene from short film "Elizabet," is the brainchild of David Long '98, founder of Trapped Bee Productions. The Baltimore-based digital production company provides services from initial design to final edit for Long's own creative ventures and for a growing client base. Its portfolio includes narrative, documentary, online commercial, music video and fundraising films. Long founded Trapped Bee in 2007, a shift from his job in marketing, sales and product development for Laureate Education Inc. His former career was "about storytelling for customers and boardrooms," recalls the former vice president of business development for the firm. "Now, I'm learning how to shift to a different audience." Long's career change gives him a chance to mix his passion with his professional background. He also does consulting work to support his self-funded production venture. He admits his path to filmmaking is atypical. "Usually people start out in film school and spend years turning it into a business," he says. Instead, Long spent his first decade after Kellogg launching new products and business divisions for education markets. At Laureate, he launched Education Station, an after-school tutoring business for students. Education Station grew into a $25 million business in 2 1/2 years before being sold to a private firm, Long says. He adds that the lessons he learned by steering businesses into profitability serve him well as he switches into his film career. Long said he remembers one Kellogg professor as particularly influential. Barry Merkin, clinical professor of entrepreneurship, created a "wholly unique" set of entrepreneurship courses. The real-life cases used dramatic and unexpected turns to upset formulaic approaches to business analysis. For example, a customer would die on a showroom floor or an organized crime gang would try to extort funds from a business. "Merkin knew how to create an 'ah-ha' moment, and that's exactly my challenge," Long says. "Filmmaking is about having people in one frame of mind, then purposefully shifting to another way of looking at the world." For instance, Long's company name lends itself to multiple interpretations. One day when checking film sound, Long saw a bee trapped in his studio window. He put it in a jar to test the noise level. A friend suggested to Long that the name had a connection with his newfound artistic freedom. "I think there's something to that," Long admits. "Maybe the creative unconscious at work." Initially jumping into filmmaking mid-career "seemed like a big risk," Long says. He recalls "transitioning purposefully" over 18 months, letting those around him know just what he intended to do. "My family and former colleagues have been a huge source of support." 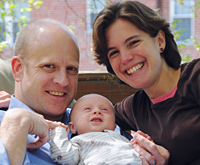 Among them are his wife Liz and son Benjamin, who was born in February. The startup demands a hands-on approach with Long "doing everything" in the initial stages. "I wanted to learn from the beginning to the end, including cinematography, writing the script, directing and producing," he says. Long believes the business climate for short-form film is receptive. He notes the splintering of broadcast television with some cable channels now dedicated to short movies and documentaries. The Internet also provides a new distribution channel for video, he says. And the cost of production has plummeted with the rise of powerful but relatively inexpensive technology. Long says he set up his production studio for around $15,000. During the company's first year, low initial expenditures allowed Trapped Bee to generate a modest profit in the first quarter of 2008, Long says. In addition to his proprietary short-film and commercial projects, Long also is working on a feature film. Examples of his work can be seen at trappedbee.com.